Recently in the tech world there were two very important and very different rollouts. One of them was for the new range of Kindles, which promises to be faster,cooler, and way less judgy than the IPad. YouTube is still burning through views as people watch the launch with it’s glossy powerpoint presentation. The handsome, and well-suited CEO is forever captured holding up the tablet letting everyone know that this will fix all your problems at a mere $50 a month data plan unless you go over. Elsewhere in tech universe Nokia rolled out their version of the Windows 8 Phone. This was a somewhat more muted affair, a bit discombobulated and clunky as the media director for Nokia read off a teleprompter about a product that he seemed to be handed four seconds before he got on the stage. It looked exciting but then you never got to really take a good look. No one was allowed to touch the new phone, no one was even given a day when it might be available in stores. This seemed a little too Katy Perry and John Mayer, it sounded like it could be something interesting but it looked like nothing actually happened. Many would say at the end of the day, what difference does the rollout make? If the product is good, people will flock to it, if it isn’t, they won’t. Many in the tech world such as the late Steve Jobs, believed that the rollout was integral to a products survival. That is why he would do every one that he could personally. Because he believed the rollout can change the game on a product like nothing else. Jobs was the king of the rollout. With his simple black turtleneck, jeans, and promise of something that was going to change everything he made the rollout an event not to be missed. Amazon has been battling Apple’s dominance for years but now they finally know that they have a chance because there rollout sent out high fives all over the world that another something cool had just come out. So that rollout maybe the thing that takes them over the top more than any line of code ever could. Nokia did not do that. Which is why after their presentation their stock fell 13 points. They probably have a great product, which if done right would have put them on the path to the top but now probably not. Simple moments in the life of a product decide whether or not it’s going to explode. 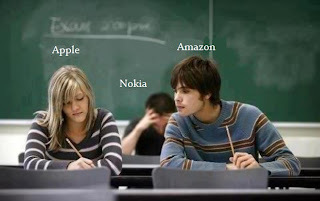 Nokia seemed to bungle their simple moment while Amazon seemed to triumph. But only time will tell if this was their last gasp or their big breath before the roller coaster ride of success.